That DC Comics is holding Talent Development workshops for writers, artists, and apparently editors seems a very good thing. On one hand, this is the exactly right measure of giving back by comics creators whose "breaks" are still in recent memory like Geoff Johns and Scott Snyder; as "breaking in" loses a modicum of its mystique, it's spot on that DC should be fostering the process. On the other hand, as composing for the cohesive DC Universe becomes more like a television show's collaborative writers' room -- and the pressure is often on writers to forego their individual stories for the good of the whole -- it behooves DC to have a cadre of writers trained in house who take as their marching orders to support that whole. 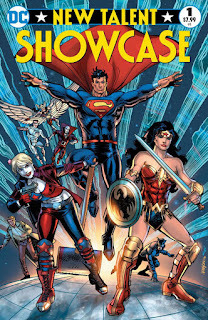 So as a DC fan I feel the New Talent Showcase #1 sampling of their work is worth encouraging. Also, given the anthology format of this book, and the fact that no one would hold these writers to continuity for this, I was similarly surprised to find some markedly contemporaneous storylines here. The Superman story explicitly involves the pre-Flashpoint Superman in his new life in the New 52 Metropolis, a story that could not have been published just six months or so ago. Superman, Batman, and Wonder Woman all sport their Rebirth costumes. Kyle Rayner's in a relationship with Carol Ferris, putting this just as recent as right before the DC You; the Wonder Girl story directly references Scott Lobdell's Teen Titans. At the same time, there's a use of Wally West as the Flash here that seems more indicative of the previous DC animated cartoon universe, which is more the kind of thing I thought this book would have. For me, the best of these was "Hawkgirl: Weapons of War" by Erica Schultz and Sonny Liew. A significant failing of New Talent Showcase is that it does not include bios of the authors, but Schultz is a rather established writer, artist, and letterer, and Liew's work goes back to Vertigo's My Faith in Frankie, not to mention Paul Levitz's recent Doctor Fate. Starring, apparently, the animated Justice League's Hawkgirl, the story sees Shayera Thal as a police detective by day, secretly tracking down alien weapons. In a scant couple of pages, Schultz gives "Detective Hall" and her partner Detective Will Cariad some clever, funny dialogue, and Liew's thin, slightly animated style likens Shayera to a 1940s movie star; the story itself has a bit of His Girl Friday vibe. Schultz's was the story foremost here that made me feel I'd be willing to read a whole series of the same. The end of the book includes a few words of explanation from each writer as to why they chose the story they did, and I can't overstate how interesting and illuminating these were. As a matter of fact, I was both impressed and looked a little askance at Hena Khan's Wonder Girl Cassie Sandsmark story (with art by Emanuela Lupacchino) in that it digs deep into Lobdell's Teen Titans to bring back Cassie's boyfriend "Diesel," though with exactly as much overwrought melodrama as Lobdell wrote the first time. But in her afterword, Khan talks about how, as the author of children's books, Cassie's struggles with boys and with her mother make her relatable to Khan and her readers. It was a reminder for me that sometimes, what I might find flawed could simply be geared toward a different audience, and the author's insight made me appreciate the story much more. I'd give honorable mention to "Superman: The Man in Black" by Michael McMillan and Juan Ferreyra; this was another where I was curious to learn what might happen next in McMillan's story, and Ferreyra draws a believably boyish Superman (though oddly, two different-looking Jokers). Also, there's something definitely inspired about Emma Beeby's teaming of Wonder Woman and Catwoman, and Minkyu Jung draws the right balance between DC house style and a bit of cartoonyness. Surely not every story in New Talent Showcase #1 is a winner, and I don't think the setup of this volume is quite right. But more of these work than don't, and at the moment DC really has no other anthology series of this type. It's a pity there's no second issue coming next month to continue these stories, but I'll certainly give it a look whenever that next issue comes around. I, too, was surprised to see that all of these shorts turned out to be prologues to stories that may or may not be told in the future. I was the most intrigued by the one about Constantine finding out that Zatanna's soul was damned to Hell thanks to something Zatara did, which I wasn't expecting to because of how fed up I was with the New 52 version of the character by the time Fawkes's run and Justice League Dark ended. And as bland as Michael McMillian's writing was, I'd like to see where he was going with his Superman/Joker story, simply because I think it's cool that the guy who played Steve Newlin in True Blood got hooked into comics by Byrne's Supergirl saga. I wouldn't mind more of the Catwoman/Wonder Woman team-up either. I'm sure if we'd seen the writing prompt itself, it would've read something like, "Leave me wanting to read more." Most of the stories simply left it with "to be continued," but on the whole I think the issue spotlight a talented set of new creators with a good grasp of characterization, which is always the DC hallmark.